CALL YOUR SENATOR TODAY, URGING THEM TO VOTE NO ON HB 370. What does House Bill 370 do? HB 370 would require sheriffs and jails to determine the immigration status of all people in their custody and then to share the information of any community member who they suspect of being undocumented with Immigration and Customs Enforcement (ICE). Local facilities would also be obligated to comply with all immigration detainer requests made by ICE. The bill would prohibit jails from releasing an individual—even though they may be eligible for release under current laws—on the basis of a request from the federal government. Finally, the bill exposes cities, counties, and law enforcement agencies to litigation by allowing anyone to take their local government to court if they believe it is preventing cooperation with ICE. This bill would undermine community safety. As an organization who works with victims of crime, we can attest firsthand this bill would make immigrant community members more fearful of working with local law enforcement. Immigrants and community members living in mixed status families who are victims of crime, have witnessed crimes, or otherwise would wish to access law enforcement services will be less willing to interact with law enforcement agencies that are sworn to protect and serve them. This bill would subsidize a rogue federal agency. North Carolina sheriffs and counties are under no legal obligation to use their limited resources to subsidize a precarious and destructive partnership with ICE. 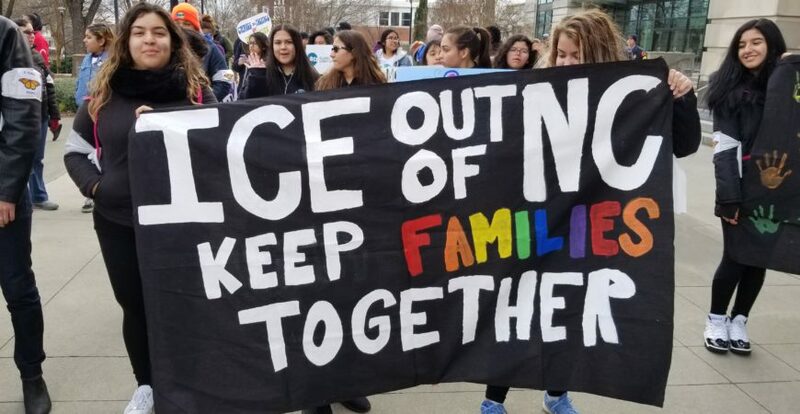 This bill would divert resources away from local communities and specifically from communities who have recognized and sought to address the damage caused by collaborating with ICE. As several North Carolina sheriffs have stated, local resources should go towards programs that build trust in our communities, not tear it down. This bill is retaliatory. When several sheriffs in North Carolina decided to prioritize their local community’s safety instead of collaborating with ICE, ICE retaliated against North Carolina as whole by detaining hundreds of residents and terrorizing immigrant communities. Bill sponsors have acknowledged that this bill is part of that retaliation. Rep. Destin Hall of Caldwell County, while being interviewed on air for Spectrum News of Central North Carolina, openly admitted that he and his colleagues worked with ICE officials to draft this bill. A federal agency that has become well-known for its civil and human rights abuses is working with legislative leaders to dictate a state policy that would hurt North Carolina. We need to send a clear message that ICE has no place in our state and no place in our politics. For questions, please contact Moises Serrano, Political Director, moises@elpueblo.org, or Angeline Echeverría, Executive Director, angeline@elpueblo.org.